Singer R. Kelly attends the Brooklyn Nets vs the Atlanta Hawks on November 17, 2015 in New York City. Robert “R.” Kelly doesn’t see nothin’ wrong with a little Dubai trip, but a Cook County judge might. 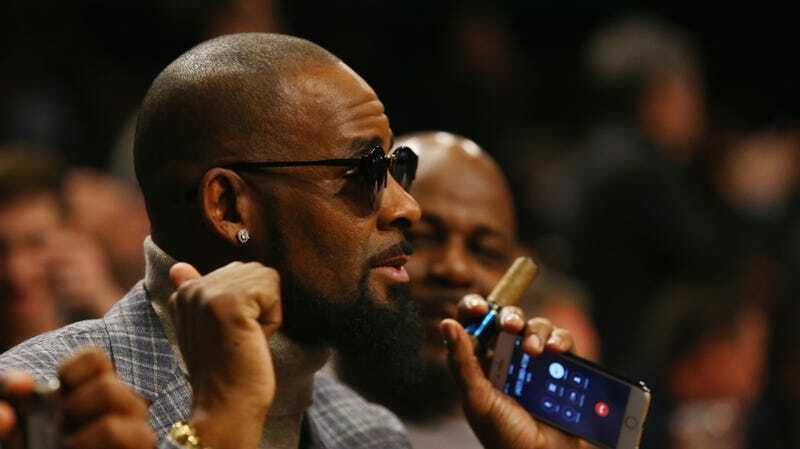 As R. Kelly awaits trial, where he faces 10 counts of aggravated sexual abuse, the 52-year-old is seeking the Cook County judge’s permission to travel to Dubai so he can perform a few concerts in order to pay off his child support fees. Kelly is accused of sexually abusing three girls and one woman for over a decade. He pleaded not guilty to all counts. According to the Chicago Tribune, as a condition of his $1 million bond release, Kelly can’t leave the state of Illinois and has surrendered his passport therein. Apparently, Kelly is finding it to be a “hardship”—affecting his children, no less—to get work in his home state, due to the allegations lobbed against him within “the #metoo movement,” according to a court filing by his attorney Steven Greenberg. Greenberg claims Kelly signed a contract last month prior to his arrest and is expected to meet the royal family upon his arrival in Dubai. Kelly is scheduled to appear at Leighton Criminal Court Building on Friday, where he could possibly request travel from Judge Lawrence Flood, who is presiding over the criminal charges against the R&B singer.